I'm working on an Ultima-inspired RPG, and wanted to get some early feedback on the look and feel of the tiled kernel. My inspiration is the early Ultima games, Ultima 3 in particular. 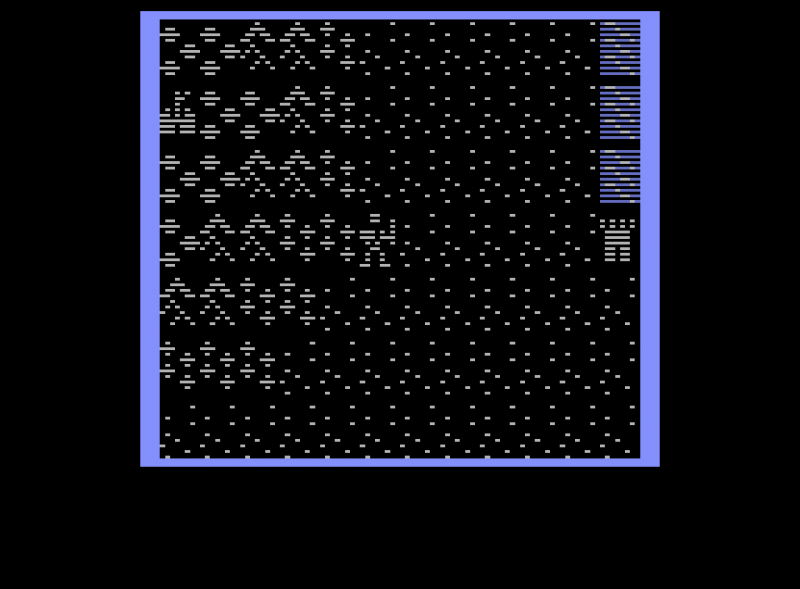 In fact, right now I am using the Ultima 3 world map for development, but will eventually switch to one of my own creation. Right now, you can wander the world by land or in a ship, and explore the castle and nearby city. 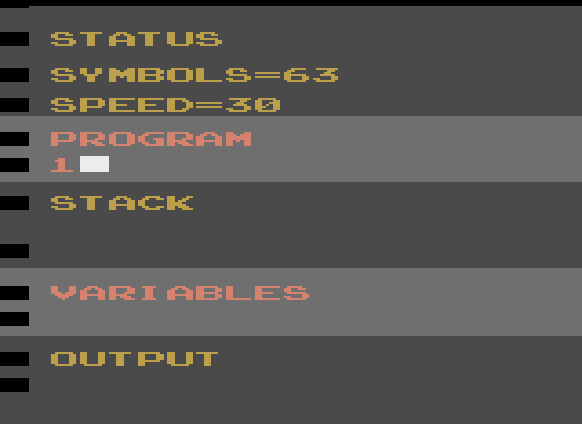 Gameplay elements will come next, with one text line for status (hit points. magic points, etc), and another for messages. Anyway, if anyone would like to take an early look at the engine and provide early feedback, I would appreciate it. One thing in particular I am wondering is if having the hero not be quite centered horizontally is going to bother people. It is 12 tiles wide, so there's no way to center him without reducing that to 11. I can certainly do that, but I wasn't sure if it would be better to have him centered, or have a bigger window. Note that this is a 64K binary (without ARM assistance), so it will require a Harmony Encore or an UnoCart to try on real hardware, and I believe it is also too big for the AFP. I'm only using a fraction of that space right now, but I will easily fill that space eventually. "Penult" world demo 4/5/2019 adds New city map, expanded castle map, and line-of-sight improvements. Nice! You’ve certainly nailed the look of Ultima III (a personal favorite RPG of mine from back in the day). Excited to see this progress. As for the character not being centered.. it would look better that way, but it’s not a game killer as is. I assume you aren’t planning a right side info/panel - which would shrink the play field and center the character? Putting anything to the right of the map isn't really possible, so status info will be on a line below the map, and text messages will be on a line below that. If you switch to 11 while still drawing 12 you could then do smooth scrolling of the world. To accomplish that give the playfield priority and hide the extra pixels behind it. Check this video at 37:00 to see BOOM! which does this in the left-right direction. You'd implement smooth scrolling up/down by adjusting how you enter your kernel. Looks great Karl, not having the hero centered doesn't make a difference in my opinion. Looking forward to see how this develops! Cool idea, but I don't think that would work for my kernel. I am using a blue asymmetric playfield to add a splash of color by making the water tiles (and boat background) blue. The tile-based movement is at least no worse than the older Ultimas in that regard, though. Edit: Perhaps I could do the color change right before the last tile, but it seems unlikely that I could do both a color change and a playfield priority change in time and not too soon for one of those. BOOM! used BUS to color the players themselves, so didn't need the playfield to add color. 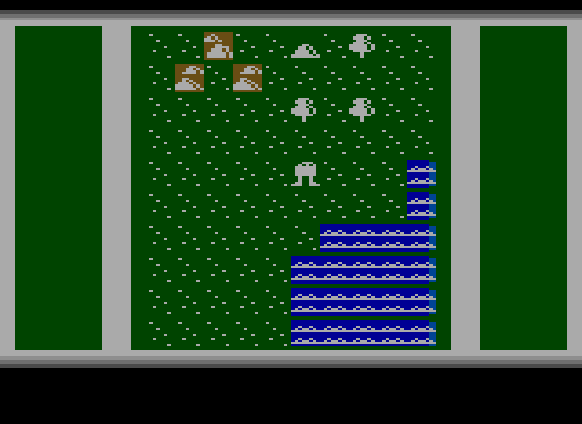 Playfield couldn't be smoothly scrolled either, so the water would look very odd while moving left/right. It's something for me to keep in mind in case I were to decide to give up on using the playfield like this, though. Anyway, I appreciate the feedback. Was able to walk around, then take the ship and move around some more. Unable to get into tunnels or Castles yet. Yeah; right now it is just the world map; I haven't added any cities/castles/dungeons yet. This is looking fantastic! I am looking forward to see how it progresses! BTW, Didn't even notice that the hero was not centered. Location:Just south of the Wisconsin border. One question, though -- when I run it in Stella, holding the joystick in a direction doesn't make your character keep moving in that direction. You have to keep nudging the stick in the direction you want to go. Is that what you intended? Wow, this plays so well. I LOVED the Ultima series and played them extensively on my C64 so you can imagine how happy I was to see this posted. 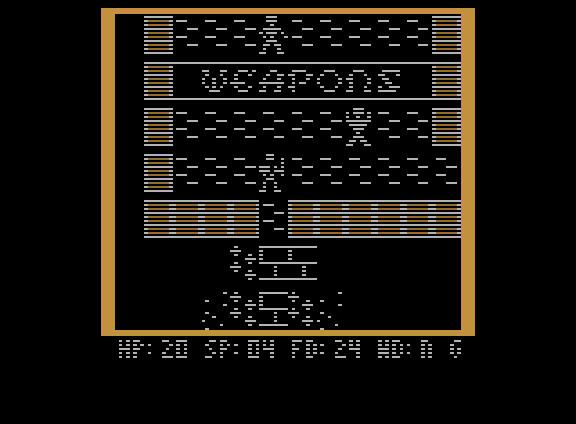 I've been waiting for an Ultima-like tile based 2600 RPG for so long, especially after seeing the now-abandoned Homestar Runner WIP game. Looking forward to showing this off on an upcoming ZeroPage Homebrew episode! Well, yes, it is intentional for the moment at least. I will eventually have it auto-repeat if it is held in the same direction. Looks great! I assume "penult" is short for Penultima which is an awesome name! Thanks! Actually, it's short for "I haven't figured out a name yet". It is a real word, though, and ends in "ult". I don't mind the hero being not in the center, because I just think of this as an awesome concept! This is I guess BUS stuffing, really cool to see! You will add some text under the map I guess? Thanks. I'm not using bus stuffing or any other ARM assistance. It's a 96-pixel display (similar to RoboMechanik), but also adding in the playfield for a bit of color for the water tiles. There will be two lines of text: one for status information, and the other for messages. I've updated the ROM in the first post. Still no gameplay, but it now supports dynamic field of vision. Specifically, the mountain and heavy forest tiles block vision, so things can be obscured on the map that are behind these tiles. Screenshots don't really capture the effect well, but to see it in action, try circling around the patch of mountains to the west of the starting area and find the town within, or find the dungeon entrance to the northeast of the starting area. If you find any bugs with the vision field support, please take a screenshot and post it! You will need to turn on phosphor in Stella (Alt-P or Command-P on a Mac) to get the whole screen. Using BUS lets you colorize each tile, as seen in my RPG demo. Both p0 and p1 is used in basic programming and homestar runner for the tiles?